From the moist high Andes mountains of South America this is a shrub that is ideally suited to the moist and humid west of the British Isles, but it seems happy growing above our rock garden pool, where it drapes its scarlet red flowering branches out over the rock face. 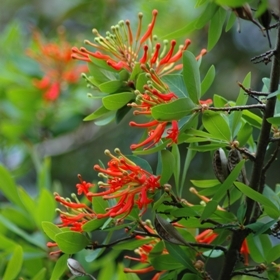 It is a member of the Proteaceae family which shows the relatedness of plants across the southern continents. Both the Banksia species of Australia and the Protea species themselves from South Africa are in the same family. Most plants in the family are bird pollinated and have colourful and dramatic flowers. You will need moist acidic soil and a sheltered spot away from late frosts to get this to grow successfully in your garden. It might be best to visit it here or move to the Scottish west coast so you have perfect conditions for it!